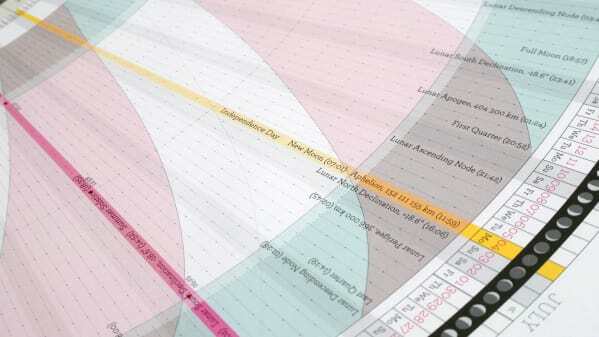 Anaptár—“calendar” in Hungarian—is an incredibly detailed, site-specific poster that not only chronicles the standard annual days and dates, but also takes viewers straight to space with all kinds of astronomical data. It’s a sun- and moon-stravaganza: Solstices, equinoxes, and lunar cycles are graphically intertwined with daily times of dawn and dusk, along with additional precise celestial goings-ons. Each featured city has its own, entirely unique print that chronicles the specifics for its particular location.